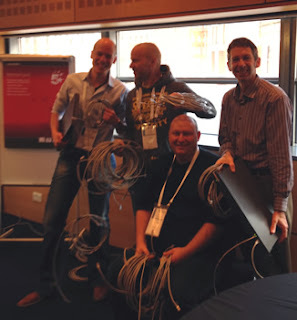 Here are some pictures and videos from the UKOUG Tech 13 WebLogic Hackathon to wrap up my previous posts on this event: introduction and resources. The videos were organized and hosted by Bob Rhubart who is manager of the architect community at Oracle Technology Network. And the winners of the WebLogic Hackathon ! Hands-on-lab material available for WebLogic provisioning using Puppet !! Last UKOUG Tech 2013 conference we organized a Super Sunday WebLogic Hackathon session. Part of this session was a hands-on-lab in which attendees could automatically provision WebLogic Server using Puppet. Several people asked if the materials of this lab can be published so they can do the hands-on-lab themselves. This blog contains links to the materials and a 5 step plan to get you up and running with the lab. Running and using the lab and VMs is of course at your own risk. Last but not least, credit goes to Simon Haslam, Peter Lorenzen, and Guido Schmutz for organizing and assisting in the WebLogic Hackathon! The setup for the lab is shown in the following figure. Read my previous blog for more info. The following presentation introduces middleware provisioning using Chef and Puppet. It shows where middleware provisioning fits in the entire process of software delivery, and what benefits the automation of provisioning offers. Finally, the presentation introduces the Hands-on-Lab. The lab uses a separate VM that acts as Puppet Master and another VM that acts as Puppet Agent. 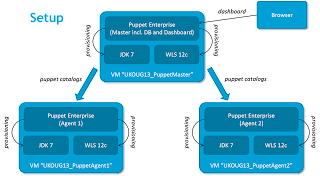 When you run the Hands-on-Lab you should at least have the Puppet Master VM running. You can add an arbitrary number of Puppet Agent VMs. The VMs can be run using Oracle VM VirtualBox. The following presentation contains a step-by-step tutorial for completing the lab. 5. Want to know more?